This page is a 'plain English' explanation of the copyright issues at this site. This can be considered a continuation of the Terms of Service file. without asking anyone (including sacred-texts) for permission. In fact, we encourage these activities. It is considered good netiquette (but not absolutely required) to identify sacred-texts as the source of the file. Therefore we request that leave any notices of attribution in the file intact, and add a link to sacred-texts if possible. The public domain files at this site have been prepared for free distribution at great labor and expense. 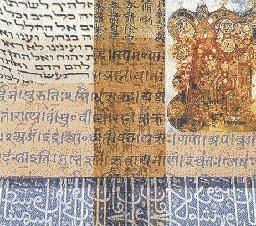 Public domain files prepared at sacred-texts may be licensed for commercial use as a way of supporting the Internet Sacred Text Archive and the production of additional etexts. These files are listed in the Bibliography. Some other public domain files at this site may have some trivial commercial-use restrictions, particularly files from Project Gutenberg. Most other public domain files at this site can be used in commercial projects without any payment. Email us if you have any questions. Note that this doesn't restrict you from using these books for commercial use if you are willing to make your own transcription of them. We have no objection to this as we do not claim to own these works. Some texts which are copyrighted or have unknown copyright status have the following icon next to their index listing: . When this icon is present on a page, or added after a given file, it indicates that the file has copyright issues which you need to consider before using it (particularly for commercial purposes). The absence of this icon indicates that we believe that the file is in the public domain. Files marked [External Site] may be copyrighted and have other restrictions on their use. Consult the particular sites' policy before using these files. Some files are copyrighted because they are original material produced especially for sacred-texts. This includes index files, the sub-section graphics and any of the descriptive material. These files, graphics and text may not be reproduced in any form without the permission of the copyright holder, J.B. Hare. These files will have explicit copyright notices. All copyrighted images at this site have explicit copyright notices, either directly underneath the graphic or at the bottom of the page. If you want to use any of these files, you must contact J.B. Hare to obtain copyright clearance. If an image does not have such a notice, it may be in the public domain. If you have any other questions about copyright issues at this site, please email us. 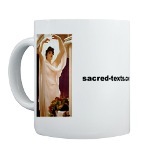 The Sacred Texts FAQ has more information about copyright issues at this site. We recommend that you read it before email us, as it may answer your questions. How do you determine if a file is in the public domain in the United States? Since my site is located in the United States, I follow US Copyright law. 1. Anything prior to 1922 inclusive (i.e. published in 1922 or prior to 1922) is in the public domain. 2. Anything published in the US between 1923 (inclusive) and 1963 (inclusive) is in the public domain if it was not renewed at the US copyright office 28 years after the date of publication. Anything else is not in the public domain, particularly books published outside the US after 1922. So first you need to do some research. You need to answer two questions: 1) was it published first in the United States? 2) What year was it published? This is not always apparent from the copyright page of a book, particularly if you are looking at a modern reprint of an older work. First I go to the MELVYL catalog (the University of California library catalog, which has practically every book ever published--even the Dee Necronomicon!). Their web address is http://melvyl.cdlib.org/. I fill in the form and get the earliest publication for the book I'm trying to locate. If it's not there (or I don't see an early entry for it) I also check the Library of Congress (http://catalog.loc.gov/). If it's not there I check Alibris (www.alibris.com) and ABEbooks (www.abebooks.com) for information about used copies. If it was first published in the US in or before 1922, it's in the public domain. If it was first published in the US after 1922, but in or before 1963, then I go to the Catalog of Copyright Renewals (http://www.kingkong.demon.co.uk/ccer/ccer.htm). This has a table with each year that something could be renewed (the year of publication plus 28 years) between 1922 and 1963. You pick a year (say 1931) go to that page and find the particular pages with the authors' name organized alphabetically. Works from 1931 could be renewed in 1958 and 1959. There are two pages for each alphabetic range. So there are four pages total to download (they are in TIF format, so you can't view them in your browser, you need to download them to your hard drive and use a image editor to view them). These TIFs have been now been converted into searchable text by Distributed Proofing and Project Gutenberg. This is broken down into files for each six-month period which can be downloaded via links at the CCR site. However, it's still a good idea to check the page images as well. If you find the book listed as renewed in one of these TIFs, then it's not in the public domain. If you don't find it in the TIFs for that particular renewal year, it is in the public domain. If there are no TIFs for that particular year at the Catalog of Copyright Renewals, then there is one last stop, the US Copyright Office search form (http://www.copyright.gov/records/). This only has renewals after 1978, so it is only conclusive for books published after 1950 or so (since the book needed to be renewed in the 28th year after publication). There are some entries that go back further. So consulting this database can be inconclusive. If it was published mid-50s to 1963 and not listed here at all then it's probably public domain. If there is a listing at the copyright office, you have to scrutinize it a bit. In some cases a book has an entry in the database because some overzealous publisher filed a claim on some new material on an older public domain book, in that case the record will state that the application only applies to NEW MATERIAL. If you omit that from the etext, you're probably in good shape. This is why I check for the earliest date of publication first. It's usually apparent what is 'New Material'. If you want to get a conclusive determination, I recommend that you contact Thompson and Thompson, 1-800-356-8630, a legal firm in Washington DC which specializes in intellectual property. Ask for their $90 special renewal searches. They go to the copyright office on foot, and about a week later will email (and/or fax and send by postal mail, if you wish) you a comprehensive report of any traces they find of a registration or renewal. You can have the copyright office do this but it will cost you quite a bit more and it takes months. If this search turns up a renewal, it's not in the public domain, otherwise, it's in the public domain. For instance, this is how I nailed down the public domain status of 'The Flying Saucers are Real' and 'The Kumulipo'. However, if it was first published between 1923 and 1964 inclusive, and renewed in a timely fashion, it's locked up for a good 95 years by current copyright law. Forget about it appearing on the Internet unless you can track down the author and their heirs and get permission; obviously this could be expensive and time consuming.